24 SMT Magazine • December 2016 I'm sure you already know that the word 'sales' doesn't mean just closing a deal or get- ting a purchase order. And certainly, it doesn't mean winning by outsmarting the buyer. A suc- cessful sale (let's say "deal") is where both par- ties get good value out of the transaction. Con- vincing somebody to buy or accept something that is not in their best interest is not sales; its deception, at best and theft at worst. And in the long run, you'd better get very good at finding new customers, because the old ones will never come back a second time. So let's talk about sales—real sales. Not pop sales ideas, not sales jargon of the day, not fla- vor of the month tactics. Let's talk about sales in the trenches. Real people. Real products. Real life. I promise you, if you follow these simple steps to build a sales foundation, you will gen- erate more sales. After hanging out my shingle as a Busi- ness Consultant, I can tell you that every single prospective client answers my, "What do you need?" question with the same answer: "We need more sales." Clients, of course, want me to focus on exactly that end goal. But when I dig into the operation of the sales organiza- tion, if there is one, I quickly discover that what is actually needed are the myriad foundation- al things that must be in place first. I have tried many analogies, but the one that I think reso- nates the best is this: You can't build a house by starting on the second floor. Together, let's start digging the foundation. I'll use real examples, but the names of individ- uals and companies have been made up to pro- tect the guilty. The stories are real, and they are current. One more caveat... If you're a fan of the movie Office Space, or of Dave Barry, you'll eas- ily recognize my sense of humor. If not—take my word for it—sometimes, ya just gotta laugh! Ready to start working on the foundation? Hang on, because we're heading down into the trenches. 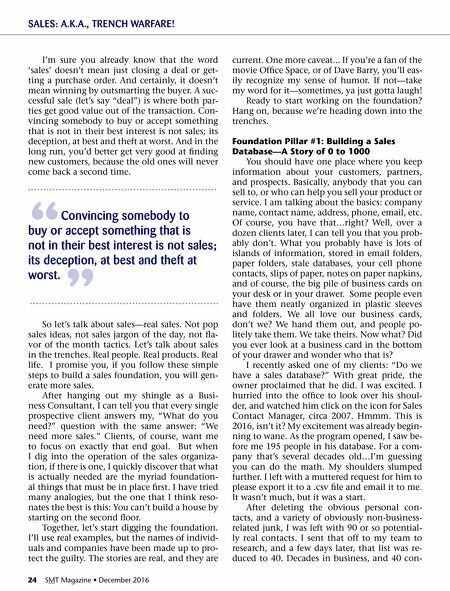 Foundation Pillar #1: Building a Sales Database—A Story of 0 to 1000 You should have one place where you keep information about your customers, partners, and prospects. Basically, anybody that you can sell to, or who can help you sell your product or service. I am talking about the basics: company name, contact name, address, phone, email, etc. Of course, you have that…right? Well, over a dozen clients later, I can tell you that you prob- ably don't. What you probably have is lots of islands of information, stored in email folders, paper folders, stale databases, your cell phone contacts, slips of paper, notes on paper napkins, and of course, the big pile of business cards on your desk or in your drawer. Some people even have them neatly organized in plastic sleeves and folders. We all love our business cards, don't we? We hand them out, and people po- litely take them. We take theirs. Now what? Did you ever look at a business card in the bottom of your drawer and wonder who that is? 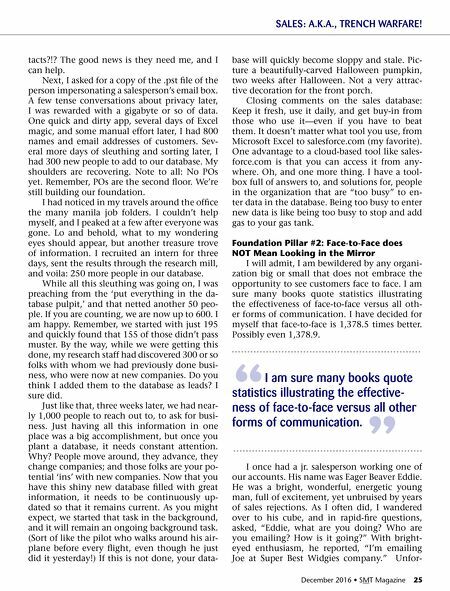 I recently asked one of my clients: "Do we have a sales database?" With great pride, the owner proclaimed that he did. I was excited. I hurried into the office to look over his shoul- der, and watched him click on the icon for Sales Contact Manager, circa 2007. Hmmm. This is 2016, isn't it? My excitement was already begin- ning to wane. As the program opened, I saw be- fore me 195 people in his database. For a com- pany that's several decades old…I'm guessing you can do the math. My shoulders slumped further. I left with a muttered request for him to please export it to a .csv file and email it to me. It wasn't much, but it was a start. After deleting the obvious personal con- tacts, and a variety of obviously non-business- related junk, I was left with 90 or so potential- ly real contacts. I sent that off to my team to research, and a few days later, that list was re- duced to 40. Decades in business, and 40 con- SALES: A.K.A., TRENCH WARFARE! " Convincing somebody to buy or accept something that is not in their best interest is not sales; its deception, at best and theft at worst. " Feature Column — Sales: a.k.a., Trench Warfare!